I am a creative person. I didn't learn how to be creative. Apparently, I just refused to unlearn it. What about you? As creativity is one of the top in-demand skills today, this article explores the unlearning process, and what we can do about it. Creativity. It's in the top 10 skills for 2020, according to the World Economic Forum . It's the top in-demand soft skill based on a LinkedIn research . According to a PWC survey, 77% CEOs struggle to find the creativity and innovation skills they need . The answer is: Yes, you are. Or, at least, you were when you were a child, you just forgot about it. George Land’s creativity test showed a shocking revelation about creativity in children : In 1968, George Land conducted a research study to test the creativity of 1,600 children ranging in ages from three-to-five years old. He re-tested the same children at 10 years of age, and again at 15 years of age. We Are LEARNING To Be Uncreative! In other words, we are UNLEARNING creativity as we're growing up! If you're interested in the details about the test, watch George Lan's TED talk . In my book, Engage the WORL&D!, creativity (plus engagement and motivation) is one of the six essential traits I've ventured to predict you're going to need in the future. Not only to survive the changes coming in our industry and the world but thrive in this new WORL&D. In the book, I offer some personal examples and stories about creativity and unlearning. Take, for example, drawing! People gave up on my drawing skills back in elementary school. If I really try hard today to draw a horse, it may end up being close to an old rabbit. I'm always amazed by gifted people who can actually draw something others recognize. One day, I bumped into this book about drawing. It claimed that I can draw too. I just unlearned that skills. It had me copy something from the book onto a piece of paper. My daughter came in the room while I was doing this "aimless" copying exercise. She saw the drawing upside down, and she said: daddy, this parrot is amazing. I had no idea what she was talking about. She flipped the page around, and there it was: a parrot. A recognizable parrot. That's what I was copying. But, since it was upside down, I didn't KNOW that I was drawing a parrot. I just copied what I SAW: lines and shades. And that's what unlearning is about. I turned off the "parrot-drawing skills," and simply looked at lines and shades. I guess this is how people draw; not what they know, but what they see. I still can't draw. But I understand now that I would have the ability if I had enough motivation to continue unlearning the skill I've been practicing for decades. If you're lucky and you didn't unlearn creativity, you most likely had the motivation and opportunities to use the skill growing up. Today, you have a huge advantage in the market because it might take long hours of practice, motivation, and willpower for others to return to their creative self. Creativity doesn't strike from thin air. Creative ideas that work don't just pop up like a genie whenever you rub your whatever you're rubbing. The truth is, before that creative idea popped up, their lots of crappy ideas popping all over. Someone much smarter said this once: to have a good idea, you need hundreds of bad ones. The challenge with creativity is that you can't turn it off and on like a tap. It has to flow all the time. Therefore, it is not only inconvenient, but it is also impossible to have creativity scheduled to show up weekly at a meeting when everyone is free. So, How Do Creative People Do That? How Do They Come Up With New Ideas? Research suggests that creative people are better at co-operating parts of the brain that do not usually act together. Our findings indicate that the creative brain is "wired" differently and that creative people are better able to engage brain systems that don’t typically work together. Interestingly, the results are consistent with recent fMRI studies of professional artists, including jazz musicians improvising melodies, poets writing new lines of poetry and visual artists sketching ideas for a book cover. If you accept that you are creative, it's just that you've been practicing uncreativity for your whole adult life, so there's hope to change that. There's hope to strengthen those connections that might have been weakened in the "creativity unlearning" project. It will take time. Most likely, much less than the time you've spent so far unlearning creativity. On the other hand, the whole "how the brain works" neuro-simplified-science-views are often just educated guesses mixed with cognitive science. Other times, some of these neuro-myths even make it to our education system . We need more time to figure out what exactly is happening inside the brain. In the meantime, what can you do now? If You're Motivated To Improve Your Creative Skills, Where Should You Start? Since you're reading this, I assume, you're a learning professional. 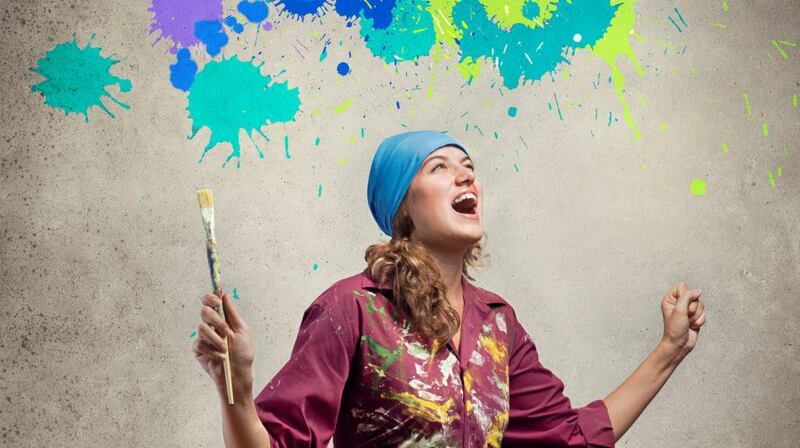 Therefore, you might be asking: Which online courses are the best to take on creativity? Well, even if courses are never a waste of time, they're not yet enough. Research has shown that in creativity, quantity equals quality. The longer the list of ideas, the higher the quality of the final solution. Quite often, the highest quality ideas appear at the end of the list. In other words, you must practice creating ideas! Bad ones. Silly ones. Impossible ones. Remember, creativity is not a new skill you're learning, you're just becoming creative AGAIN. To help you with this effort, let's borrow some insights from "Seven habits of highly creative people" and apply them to L&D . What Might These Habits Mean For L&D? Absorb the problem from different angles. Ask lots of questions. Don't try to solve anything. Listen carefully. Think of this as a conversation with a good friend who has a complex problem that they may or may not even know all the details. They may even be part of the problem! Form the question you're looking to answer! Focus on what you want to achieve, not what you want to fix. Don't try to solve it yet, just form a clear question to answer. Collect questions you find compelling. Put on the "beginner's mindset". Ask a lot of why questions. The hardest thing will be trying not to answer or solve. Let your brain do the work. If you force the answer, you'll get what you know. It's like drawing the parrot. You will draw a parrot that should look like a parrot based on your knowledge. Be curious. Combining ideas, and making connections are key practices of creativity employed by artists, designers, and scientists. So are they for learning experience design? Playtest what-if ideas! What if we didn't build any training? What if the course opened up with the worst-case scenario, and you have to make a decision right away? What if the application screens are rooms, and you're playing Clue? Who did it? Where? With what command? Some of these may be bad. Silly. Or good. That's the point. Keep creating them! Build prototypes and playtest. Some of these will be just mental models in your head. Some others will be hands-on products. Experiment, explore, learn, and share! Failure is not an option. It is a must. Relax! Pay attention to your needs. Enjoy time with your friends, your family, spend time with whatever your passion happens to be. Sleep! There is no secret pill here. The "inner child" concept works for some, while others run miles away from it as "cliché". Whatever helps you get back to the state of mind of the curious child, find your own secret method. Games are excellent! Playtest! Share your ideas with others! + 1 Creativity has its own cycle. Read more about the ARIA creative process model I shared in 2015 . Creative ideas often emerge not when you want them but when it's the least convenient for you. Like in the shower! Please, exercise caution when taking a creative shower! If these thoughts have inspired you to explore your creativity, write it down as a goal! Even better, share the article with someone, and let them know about your goal. Be creative! Writing down goals and sharing them may increase your chances to achieve them .